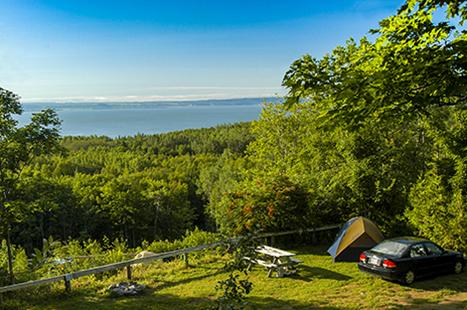 At 225 meters above sea level, the Camping des Érables offers a breathtaking view on the St. Lawrence River. Located in La Malbaie, 3 km from the Casino de Charlevoix, the Camping des Érables offers 30 grassy sites for the nature lovers who keep coming back year after year. Its multiple plateaux carved on the side of the mountain give a truly unique aspect. In business since 1963, the Charlevoix Camping des Érables was able to keep its traditional approach of a nature-oriented campground. The Charlevoix Camping des Érables can accommodate ONLY tents, trailer-tents and small Wesfalia-type caravans (B class). In addition to the traditional services such as toilets, showers, laundry room, electricity and shelters, campers have access to free hot showers, free potable water for each camping site and free internet Wi-Fi.